This week, I take a look back at a conversation on conservation – with Nan Sterman, co-author of Water-wise Plants for the Southwest and expert on waterwise gardening. Although she spent some years away, Nan grew up in and returned to southern California and has become known as a water-wise guru. 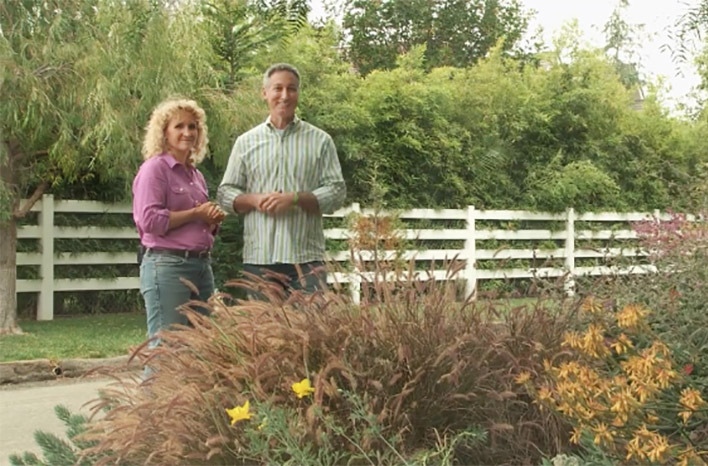 Nan speaks frequently on water conservation, and she has been a guest expert on my show Growing a Greener World®. The GGW crew and I travelled to her San Diego home to film in Nan’s lush Mediterranean-climate landscape and learn her conservation methods. I spent time with Nan Sterman at her San Diego-area property during a filming for Growing a Greener World. Water is becoming an increasingly precious commodity around the world, and California is certainly a prime example. With a booming population and sparse rainfall, water is on the minds of many. Still, it’s easy to turn on the kitchen faucet or garden spigot and lose sight of where that resulting flow of water comes from. For most of the global urban population, that water must travel a great distance to reach homes. In California for instance, the water supply is transported for hundreds of miles through an elaborate, mechanized system to reach heavily-populated areas like Los Angeles and San Diego. Moving all that water uses a lot of another precious resource – energy. In fact, nearly 20% of the California State energy budget goes toward the moving and purifying of water for state residents and the agricultural industry. Regardless of where you live, using water wisely has never been more important. Did you know that running water for five minutes from a spigot or faucet can use as much energy as a 60 watt bulb uses in up to 12 hours? Clearly, it’s not just how much water we use that is important, but how we put it to use. In spite of punishing heat and frequent drought conditions, Nan’s San Diego-area landscape remains full and thriving. How does she accomplish that while using minimal water? First off, she chooses the right plants for her climate. Nan’s property is full of plants native to California – but also native to South Africa, southern and western coastal Australia, coastal Chile, and the Mediterranean. 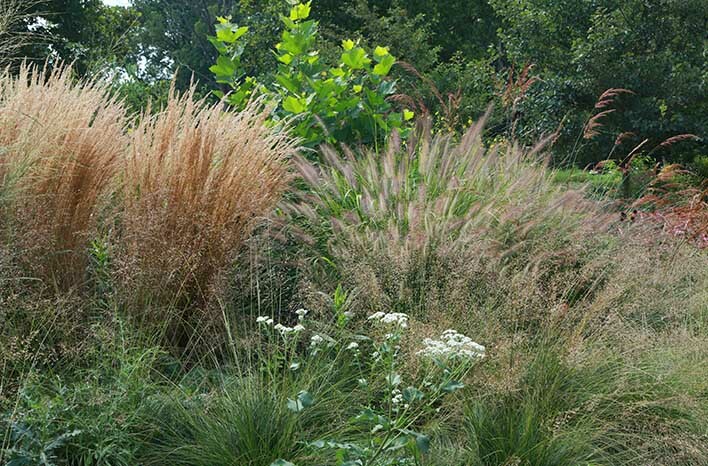 Each of these areas is known for long, hot, and dry summers; and plants native to those areas have developed a tolerance for those arid conditions. We collect gray water at the GardenFarm – like the water left after rinsing vegetables in the sink. I put the gray water back into the garden whenever I notice a plant showing signs of drought-stress during particularly hot days. Selecting the right plants for your climate will provide benefits no matter where you live, and while natives are best, you can expand your options with climate-similar plants which will thrive in your region. Perhaps, the yarrow native to your region doesn’t stir your gardening passions. You can expand the list of plants appropriate to your area by looking for similar climates across the globe and designing with their varietals. If you live in the high desert of Colorado, look to the high deserts of Argentina for additional plant choices. If you live in the humid heat of Florida, look to the humid-, heat-loving flora of South America’s rainforests. If you live in the Canadian tundra, check out specimens native to the fjords of Norway. You get the picture. To manage water wisely, Nan also employs a fundamental principle still underestimated by many gardeners. 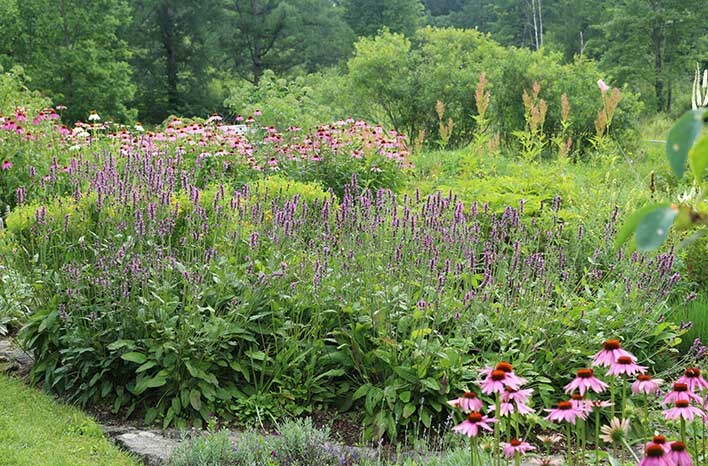 She regularly amends her landscape and garden beds with organic material. Because her native soil is sandy, it can’t hold water. Organic amendments feed her soil to increase its ability to retain moisture to be more available to plant roots for longer periods through dry spells. Over time, her sandy soil has become a fertile loam. I’ve provided a list of my favorite organic amendments on a recent podcast episode and accompanying show notes on raised bed gardening. You can find the list under the Building Your Garden Soil section. Focus on your soil, but also, give thought to how you are delivering water to your plants. Some methods, aside from being wasteful, can cause harm. Rather than broadcasting water with a traditional sprinkler system, Nan has established a drip irrigation system to deliver water as efficiently as possible throughout her Mediterranean-climate landscape as well as to thirstier plants, like in her vegetable garden. 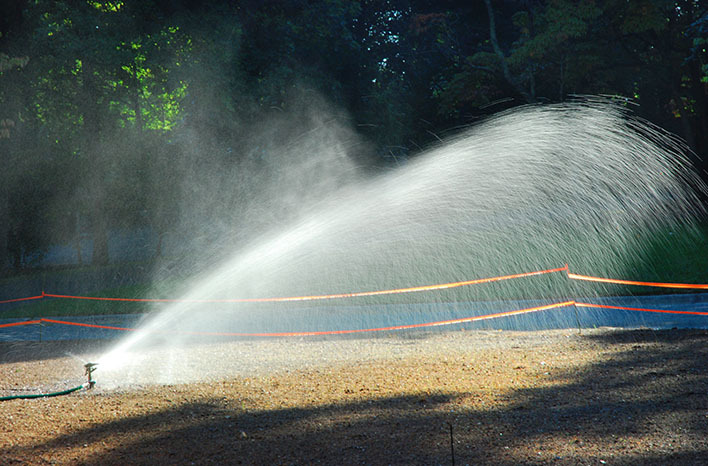 Sprinkler systems are necessary in some instances, but they are an incredibly wasteful method for delivering water. By spraying water through the air, much of that moisture is lost to evaporation. If it’s necessary to use a sprinkler system, be sure to do so during early morning hours to reduce evaporation from heat and wind. Overhead sprinklers can actually do damage and foster disease when water hits foliage and plant structure. Remember too that plants irrigated by a sprinkler are watered disproportionately – with those nearest to the sprinkler head receiving the brunt of the impact and moisture. The soil under plants near the back of a bed often remains dry. Watering through the air, using a sprinkler, is sometimes necessary – but it is incredibly inefficient. If you must water with a sprinkler, do so only during early morning hours to reduce evaporation. Also be careful not to water too frequently. Drip irrigation systems – as well as soaker hoses and emitter tubes – deliver water slowly and directly at the base of the plant. Nan’s irrigation system keeps all the water at the soil surface. All the moisture is made available to plant roots, which is where that water is most needed. Because Nan sets up her system on an automatic timer, she is able to adjust frequency and timing to each area’s precise need and rest easy knowing her plants are receiving irrigation whether she is home or not. Which begs the question: How does she know how much water each area really does need? She has developed what she calls The Canary Test. Did you know that more plants die from overwatering than from lack of water? Sometimes we love our garden and landscape to death. Nan relies on plant observation to determine her ideal watering schedule. She uses horticultural canaries in her landscape. Many years ago, underground miners were at risk from toxic gases deep within the earth. Since canaries were more sensitive to these fumes, miners would bring the birds down into the tunnels with them. If a bird began to falter, the miners knew toxic fumes were present and could evacuate to safety. Nan uses the same basic principle in her garden. She turns off water to one zone in her garden and notes the date. As days pass, she observes the plants in the group until she notices the first plant to show wilting or other signs of stress. This plant becomes her canary. She then knows how many days the entire area can go between waterings, and she sets her system to water just a day or two more often. By performing this canary test in each zone and during different seasons of the year (to account for varying heat and moisture levels), Nan knows she is watering often enough – but not more than is necessary. 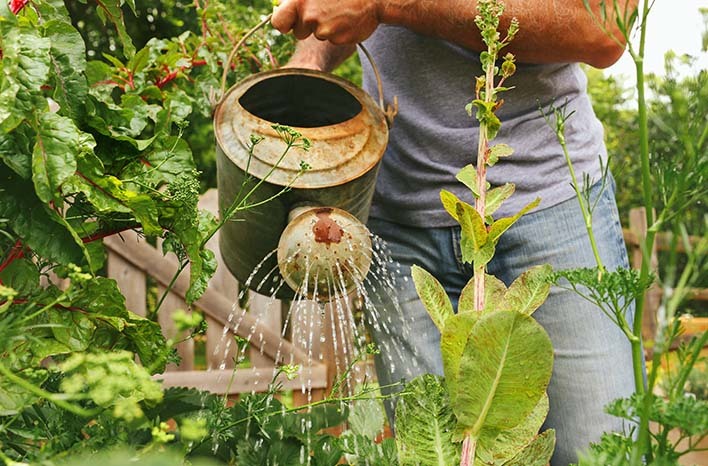 By turning off the water to areas in your garden – and observing those plants to spot which shows the first signs of stress – you can identify optimal watering frequency for the entire area. It’s common among gardeners to water too frequently. Oftentimes the task of watering is reliant on our habits and time availability – which is why automation can be every gardener’s best friend. Automatic watering systems make irrigation more efficient, but they are great timesavers too. It does take some up-front time to set everything up properly, and you may need to do a little initial homework – like knowing the type of soil you have and the types of plants you have in each zone. But the time and money you save throughout the season – and in seasons to come – will pay off in spades. Irrigation control systems make it pretty easy to get started too. Many systems are designed to walk you through set-up, and the manufacturer is always a great resource for questions or guidance. Even a simple technique, like connecting emitter tubing to an inexpensive, battery-operated timer can make a world of difference. Using a watering delivery method, like drip irrigation, isn’t just important in areas suffering from water shortage. For example, horticulturalists caring for public gardens in the muggy climate of Chicago were struggling with mildew in the landscape. The overhead sprinklers used in the gardens sprayed plant foliage already stifled by humidity, and plants were dying. Switching to a drip delivery system, which kept water at ground level, made all the difference. Mildew issues became manageable, water usage was reduced, and the plants were healthier. Like me, Nan places a generous layer of mulch around all her plantings. A 2-3” layer of mulch is a silver bullet in your garden. It insulates the soil to protect from heat and evaporation and increase the amount of time the soil remains moist. A good layer of mulch can reduce your water consumption by up to half. Mulch prevents weeds – since those weed seeds don’t see the light of day to germinate. And when you use an organic mulch – like leaves or arborist wood chips – that mulch breaks down over time to improve your soil texture and fertility. Before you buy, remember that mulch is another product where quality is key, so know your source. Many of those color-tinted mulches, for example, are made with recycled pressure-treated wood, containing chemicals. On the other hand, not all suppliers use sustainably-sourced materials, so check for that too. Nan prefers to buy her mulch from municipal green waste facilities. Unlike local nurseries, municipal facilities are typically held to stringent ISO standards. That’s not to say your local nursery won’t also have a quality product – just do your homework. Ask good questions to understand what you’re buying. 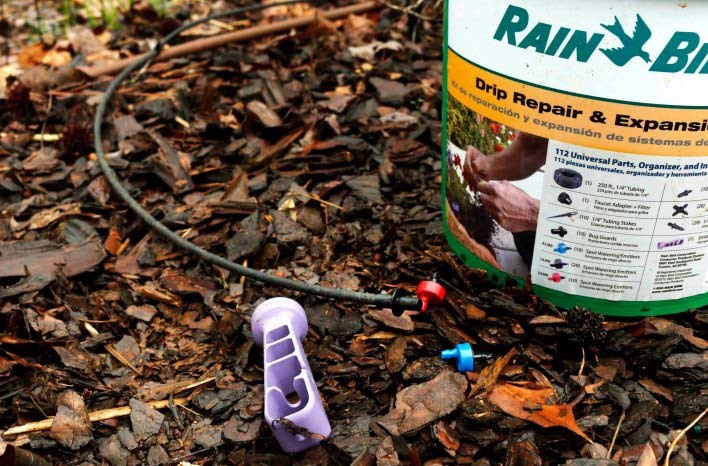 Drip irrigation kits are widely-available at nurseries and home improvement stores. They are fully-customizable, easy to install, and provide water directly at plant roots. Water is becoming more limited and precious throughout the world every day. We can’t continue using water the way we have – it’s just not sustainable. The good news, though, is that using water wisely doesn’t have to be a sacrifice. Following these water-wise methods will save you time and money. There’s more on the podcast recording, so in case you’ve missed it, you can scroll to the beginning of these notes and click the playback button. I also encourage you to check out Water-wise Plants for the Southwest, a book Nan and I co-authored. It offers lots more advice and methodology for gardeners in all climates. Joe Lamp’l is the creator and “joe” behind joe gardener®. 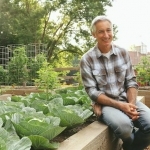 His lifetime passion and devotion to all things horticulture has led him to a long-time career as one of the country’s most recognized and trusted personalities in organic gardening and sustainability. That is most evident in his role as host and creator of Growing a Greener World®, a national green-living lifestyle series on PBS currently in production of its ninth season. When he’s not working in his large, raised bed vegetable garden, he’s likely planting or digging something up, or spending time with his family on their organic farm, just north of Atlanta, GA.